Easy Access from all directions: First exit north of Bloomington (near Oliver Winery) easy trip up I-69 to Airport or Indianapolis. If you are looking for your Forever Home, then look no further! This is your "Custom Built" home, with the proof in the quality and attention to details. 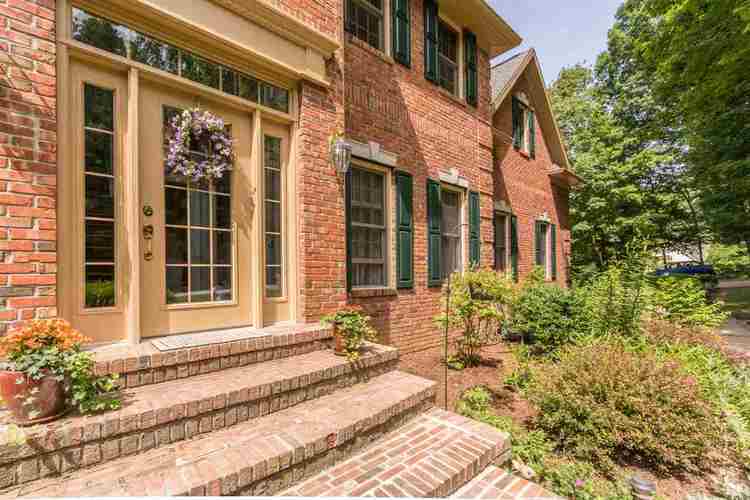 Beautiful stately home on a quiet cul-de-sac surrounded by wooded views in peaceful Windsor Private neighborhood. This home boasts the Country feel within minutes of everything. Greenspace all around with woods in back and front providing plenty of privacy, room to garden, watch wildlife, or add that Swimming Pool you've always wanted. Crown molding, wainscoting, stainless appliances, two kitchen sinks, tray ceilings, custom cabinetry, geothermal heating, fireplaces, library, walk out basement, wet bar, walking distance to Oliver Winery. Room for stackable washer/dryer in upper level hall bath for proximity to bedrooms. Visit Today! Directions:Take I-69 to Sample Road Exit, go East to Wayport Road roundabout, turn North towards Oliver Winery. Take right into Windsor Private onto Thames, left on Wexford. Home is on the right towards the end of cul-de-sac.